"José Martins" redirects here. For footballer, see José Gouveia Martins. 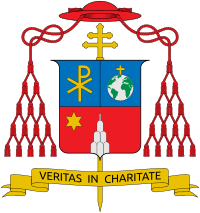 José Saraiva Martins, C.M.F., GCC (born 6 January 1932) is a Portuguese Cardinal of the Roman Catholic Church. He is the Prefect Emeritus of the Congregation for the Causes of Saints, having served as prefect from 1998 to 2008. Born in Gagos de Jarmelo in Guarda, Portugal, to Antonio and Maria (née da Natividade Martins) Saraiva, he joined the Congregation of the Missionary Sons of the Immaculate Heart of Mary, commonly known as the Claretians, and professed his vows on 22 August 1950. Martins was ordained as a priest by Archbishop Ettore Cunial on 16 March 1957. He studied at the Pontifical Gregorian University and the Pontifical University of St. Thomas Aquinas (Angelicum) in Rome, where he earned a licentiate and a doctorate (respectively) in theology. Saraiva taught metaphysics for a year in Marino, Italy, then in 1959 came to the Roman Claretianum, where he taught fundamental and sacramental theology for a decade. He became rector of the Pontifical Urbaniana University for three terms (1977–1980, 1980–1983, 1986–1988). On 26 May 1988, Saraiva was appointed Secretary of the Curial Congregation for Catholic Education and titular archbishop of Thuburnica. He received his episcopal consecration from Cardinal Agostino Casaroli, with Archbishops Jan Pieter Schotte and Giovanni Battista Re serving as co-consecrators, on the following 2 July in the Basilica of Ss. XII Apostoli. On 30 May 1998, he was named Prefect of the Roman Congregation for the Causes of Saints, the organisation within the Roman Curia that pronounces judgments on beatifications and canonizations. Saraiva Martins was created Cardinal Deacon with his titular church that of Nostra Signora del Sacro Cuore, by Pope John Paul II in the consistory of 21 February 2001. All major Vatican officials automatically lose their positions during a sede vacante, and the cardinal lost his position on 2 April 2005 on the death of the Pope. He was one of the cardinal electors who participated in the 2005 papal conclave that selected Pope Benedict XVI, who later confirmed him to office (on 21 April 2005). On 8 July 2008, it was announced that he would be succeeded by Angelo Amato. On 24 February 2009, he was promoted to the order of cardinal bishops, with title of the suburbicarian see of Palestrina. ↑ "Promozione all'Ordine dei Vescovi dell'Em.mo Card. José Saraiva Martins" (in Italian). Press Office of the Holy See. 24 February 2009. Retrieved 2009-02-24.